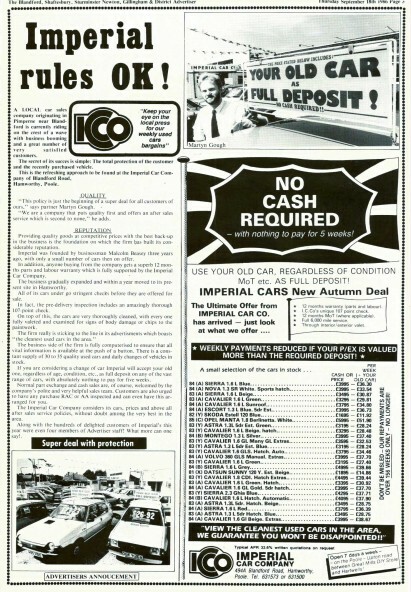 Imperial Leisure Vehicles Ltd, then known as The Imperial Car Company, first opened for business at their existing premises in Poole in April 1986. Catering for the value-for-money family saloon car market and always looking for new ideas to increase sales we were one of the very first car dealers in the south of England to offer inventive new ideas such as No Deposit finance, Interest Free Credit and many other innovative inducements which, whilst commonplace now, were seen as fresh and original at the time. Our philosophy of looking after the customer built a loyal following of satisfied customers, generating repeat sales and many recommendations. And so our business thrived. New possibilities arose with the advent of “grey import” vehicles from Japan in the 1990’s. The availability of high quality, high specification vehicles seldom seen on the roads of Britain meant fresh opportunities. Appealing to our entrepreneurial nature we jumped at this new chance and soon had a forecourt full of people carriers, 4X4’s and sports cars the likes of which we had rarely encountered. Toyota, Nissan, Isuzu, Mitsubishi, Mazda; they came in by the boat load. But one stood out - literally! With it’s unique electric lifting Auto Freetop roof the Mazda Bongo Friendee captured our imagination. With sales booming but competition in the grey import market increasing we looked for “The Next New Thing”. We didn’t have to look far. The opportunities the Bongo offered were too good to turn down. Working with a local coach building company we set about designing and manufacturing our unique camper conversions. First, the Solent: simple, smart, quality. Next, the Portland: unique in concept, shrugging off tradition, a distinctive rear conversion. Then the Lulworth: style, finesse, a tour de force. With a range of camper conversions which offered a whole new look for small motor caravans, the appeal of the Bongo grew and grew. Adding the Moonfleet and Purbeck, we became the place to come; not the cheapest but always the best. Our emphasis as always on quality - of the vehicle, of the conversion and, of course, of our aftercare. Production of Mazda Bongo Auto Freetops ceased in 2005. Availability in Japan is all but over. Added to which, the condition of early Bongo UK imports is becoming an increasing cause for concern. But whilst there are scarcely any examples left of the standard we insist upon, we do still occasionally find a hidden gem. And so the search began again. Seeing the writing on the wall, in 2015 we looked to see what could replace the legend that is the Bongo. They were big boots to fill, but fill them we did. Introducing the Toyota Alphard. New models, new ideas, new creations. Lexus heritage, Toyota backup, Imperial innovation. Aim for the stars, and the star is Alphard!